I have a very easy Chicken Stir Fry Recipe that I am so excited to share with you. Why am I so darn excited? Besides the fact that I love food. Love food. 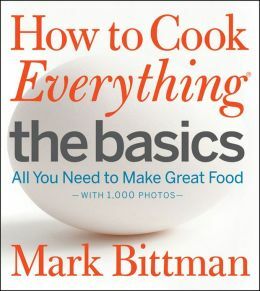 I’m excited because I am making my way through the book ‘How to Cook Everything: The Basics‘ by Mark Bittman. You can read all about the book here. 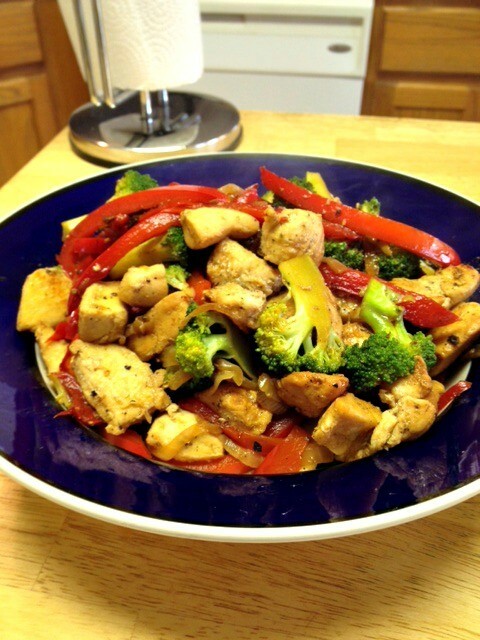 The first thing I made was this super easy Chicken Stir Fry. How did it turn out? It was a winner and definitely something I’ll be preparing again for my family. I adapted the recipe a little to our taste. 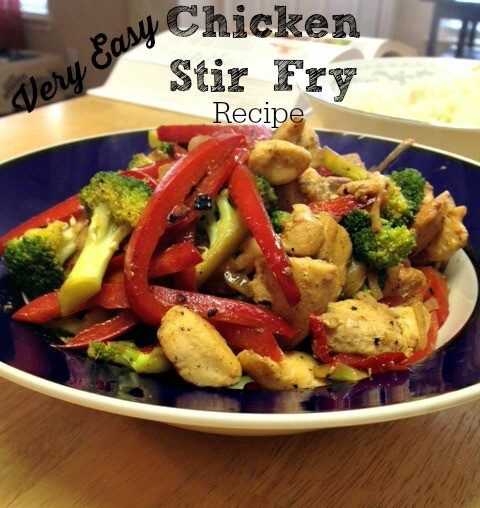 An easy to prepare Chicken Stir Fry Recipe that's perfect for those busy nights. Cut the chicken into bite sized chunks. Heat 2 tablespoons oil in a large skillet over medium high heat. Add the chicken when it's hot and sprinkle the chicken with salt and pepper, stirring once. Let the chicken sit and cook (don't mess with it!) about another minute until it's starting to brown. Sprinkle the garlic, ginger and onion on top. Stir it once and let it cook until the chicken is no longer pink and the vegetables are soft, about 3 to 5 minutes. Remove everything from the pan, with a slotted spoon so you leave the juices in the pan. Add another 2 tablespoons of oil and add the broccoli. Cook the broccoli on high heat, stirring frequently, until it starts to turn a bright green and chars a bit. (Watching the broccoli turn a bright green is for some odd reason, fun for me.) This should take about 1 to 2 minutes. Add 1/4 cup chicken broth (use this rather than water for yummy flavor) and stir the broth while scraping the bottom of the pan to get the bits and pieces up. Taste a piece of broccoli to see if it's cooked to your liking. After the broccoli is done, add the chicken mixture back to the pan and toss. Add the soy sauce and another 1/4 cup chicken broth. Toss again. Taste the stir fry and add more salt and pepper if you'd like. Serve with rice if you like. Easy right? This is a chicken stir fry recipe I’ll be coming back to over and over again. These are all ingredients you can keep on hand when you need to whip something up real quick like. Try it and then let me know how it turns out! Previous articleRed, White and Beautiful for Memorial Day Weekend – Nautica Inspired! How Much Water Should I Drink Everyday? thanks for my easy dinner night! I’m excited to eat! I would love to hear your sauce recipe!